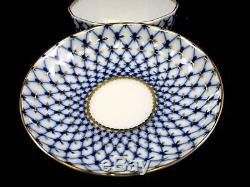 Lomonosov Design 23-pc Russian Cobalt Blue Net Tea Cup Set, Saint Petersburg 24K. 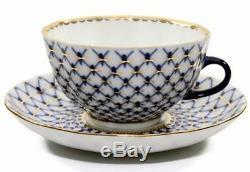 23-pc Russian Cobalt Blue Net Tea Cup Set, Saint Petersburg 24K. Founded in 1744, the first porcelain factory in Russia was created by order of Empress Elizabeth, daughter of Peter the Great, to serve native trade and native art. The factory produced wares exclusively for the ruling Romanov family and the Russian Imperial court. Attempts to reveal the secret of hard paste true porcelain-making had expanded to Russia since the visit of Peter the Great to Saxony in 1718. Dmitry Ivanovich Vinogradov, a talented mining engineer who studied metallurgy at Freiberg, Saxony, invented the formula for the Russian porcelain works established in 1744. In 1925, on the occasion of the 200th jubilee of the Russian Academy of Science, the factory was given the name of the academy's founder, Mikhail Lomonosov. It became known as the Leningrad Lomonosov Porcelain Factory which produced a range of wares, including collectible animal figurines and dinner sets. Bone china is the strongest of the porcelain or china ceramics, having very high mechanical strength and chip resistance, and is known for its high levels of whiteness and translucency. Its high strength allows it to be produced in thinner cross-sections than other types of porcelain. Bone china is a type of soft-paste porcelain that is composed of bone ash, feldspathic material, and kaolin. The first commercially widespread bone china was developed by the English potter Josiah Spode in the early 1790s. It has been defined as ware with a translucent body containing a minimum of 30% of phosphate derived from animal bone and calculated calcium phosphate. Famous inspired Lomonosov Blue Cobalt Net design. Bone China Porcelain Service for 6. Cup And Saucer Tea / Coffee Set. 6 x Cups (8.5 oz) x 2.5H. 6 x Round Saucers x 6. 1 x 9H Tea Pot w/lid. 1 x Sugar Bowl w/lid (5H). 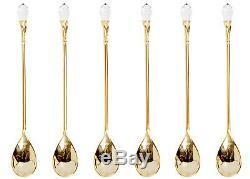 6 x 24K tea spoons w/ crystal tip. 24 Karat Gold Plated Trim. Makes a Unique Gift for. Domestic orders include tracking info. In cases of a factory defect we will replace the product at our cost. The item(s) and packaging must be in new, unused and undamaged condition. World Gifts is an online store offering a variety of all new merchandise at great prices. Our products are 100% new unless otherwise noted. We work with the biggest suppliers of high quality merchandise to bring you the highest quality items. We know that it is important for you to receive exactly what you've ordered and fast! As you can tell from our feedback history, close to 100% of our customers are very satisfied shopping with us but In a rare case if something does go wrong, please contact first us so that we can make thinks right! We guarantee you only the best experience when shopping with us! We usually respond within 24 hours on weekdays. Listing and template services provided by inkFrog. 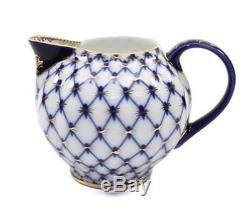 The item "Lomonosov Design 23-pc Russian Cobalt Blue Net Tea Cup Set, Saint Petersburg 24K" is in sale since Saturday, November 19, 2016. This item is in the category "Pottery & Glass\Pottery & China\China & Dinnerware\Lomonosov". 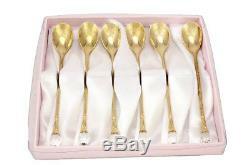 The seller is "worldgifts1" and is located in Fair Lawn, New Jersey. This item can be shipped worldwide.